You can picture it can’t you? There we are, emptying our bulging post office box of packages and parcels galore (okay, there was just one) and in it was this gloriously colourful piece of cover art smiling up at us, bursting at the seams with unbridled, unapologetic pOp music. First single ‘We R One’ gives a sub-four minute hint at what to expect from the rest of the album, with it’s uplifting lyrics that hint at the journey brother and sister duo Sean and Sarah have been on. The single missed the top ten in the UK earlier in the week, debuting at an ominous No.13. The Pete Waterman (from Stock-Aitken-Waterman fame) co-penned ‘Let Me Be The One’ harks back to the glory days of Steps with it’s dramatic ballad intro, burst of ‘Tragedy’-esque dance beats and bright chorus. There’s a cover of the ’80s Starship classic ‘Nothing’s Gonna Stop Us Now’, a cover of the High School Musical hit ‘Breaking Free’ and further down the list, a kitsch cover of the Kylie/Hazell Dean classic ‘Turn It Into Love’. ‘I Need A House’ (covering Swedish pOpstress Marie Serneholt) harks back to the classic sounds of ’80s Eurovision winners Bucks Fizz, the duo asking for someone to love, “I need a house, I need a room, I need a bed to sleep in… I need a friend, I need a love, I need someone”. Clearly, they don’t need much! The vocoder vocal introduces the disco-stomping ‘If You Can’t Dance’ – H & Claire had ‘DJ’, Sean & Sarah have ‘If You Can’t Dance’, while the tempo slows on ‘Right Between The Eyes’ still with a driving Celine ‘I’m Alive’-esque feel. There’s a touch of Abba’s ‘Does Your Mother Know’ to introduce possible future single ‘All The Roads Lead To Heaven’, with a stabbing guitar intro and an insanely feel-good, life affirming chorus. ‘Better Love Me’ is Steps’ ‘It’s The Way You Make Me Feel’ part two – astonishingly was written by the same person, Jorgen Elofsson (get out!? REALLY!?). In summarising, the album is delightfully colourful, alarmingly familiar, sugar coated, unashamed pOp and we know it won’t be to everyone’s tastes. We reckon that they might just have aimed this at a market that’s a bit too young to understand the concept of racing into an actual store to purchase a copy of the album. If anything, it’ll be British parents buying this album for their kids in the lead up to Christmas. There are some great pOp moments and some awesome melodies and if you’ve been spending the last few years pining for the heady, glorious days of Steps, you’re gonna love it. However, it’s just a little too ‘then’ and not enough ‘now’ to float our pOp boat. 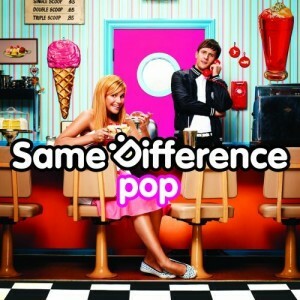 Same Difference’s album ‘Pop’ is available in the UK, with no plans for an Aussie release.